"The centre will ensure that policymakers and businesses have access to the right expertise for robust decision making, and will support innovation in the sector. In addition, it will help develop the next generation of water leaders"
The Centre will bring together a critical mass of the Scottish water research community to focus on developing talent, promoting innovation and maximising impact both at home and abroad. 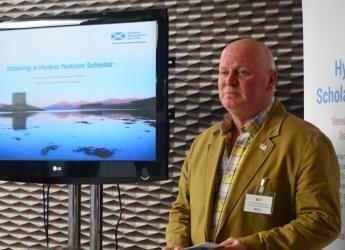 It will link water research initiatives such as the Centre of Expertise for Waters (CREW), the Hydro Nation Scholars and Fellows Programme, the recently-announced Water Test Network, and activities supported through the Scottish Government's Strategic Research Programme and international activities, among others. The Scottish Government’s Cabinet Secretary for Environment, Climate Change and Land Reform, Roseanna Cunningham MSP, commented: “I very much welcome the James Hutton Institute’s committed engagement in our Hydro Nation agenda and I am therefore very pleased to welcome the establishment of the Hydro Nation International Centre at its Craigiebuckler campus in Aberdeen. “This new Centre is aligned with ongoing support from the Macaulay Development Trust and will bring together all of the Institute’s Hydro Nation work in one place as the core of a broader offering to the sector. Promoting Scotland as a Hydro Nation benefits Scotland through the economic development and good stewardship of Scotland’s water resources and share best practices with the world. It is hoped that as a Hydro Nation, Scotland will develop the value of its naturally abundant water resources; build on and improve the productivity of its water industry; capitalise on the international market potential of water and respond to the immense water challenges that population growth and climate change bring. Beyond this, the initiative seeks to ensure that the environment in Scotland is protected and enhanced through the good management of Scotland's water; also aiming to use greater water efficiency to make water an energy asset, and contributing to the global water debate. Scotland is a water-rich country and has the wettest climate in the United Kingdom, with the Western Highlands of Scotland being one of the wettest places in Europe. Over 1.9% of land surface in Scotland is covered by freshwater, with around 70% of the area and 90% of the volume of all the UK's inland surface water found in Scotland. The water contained in Loch Ness is nearly twice the amount found in all the standing waters of England and Wales combined. The Centre of Expertise for Waters (CREW) is a Scottish Government-funded partnership between the James Hutton Institute and Scottish universities and runs the Scottish Government’s Hydro Nation Scholarship Programme and Graduate School. Visit https://www.crew.ac.uk/ for more information. The Hydro Nation Scholars programme is an open competition for PhD scholars to undertake approved projects hosted within Scottish Universities and Research Institutes. See https://www.hydronationscholars.scot/ for details. The Macaulay Development Trust is a charity which supports excellent research into the sustainable use of land and natural resources, for the benefit of people, their communities and the environment which aligns with the vision and legacy of TB Macaulay. Visit https://www.macaulaydevelopmenttrust.org for more information.